As part of our ConveyorPro range, Transmin supplies a wide range of rollers to suit most conveyor applications – engineered according to the highest industry standards. Roller material, lengths, diameters and slot options can all be tailored to client specifications. 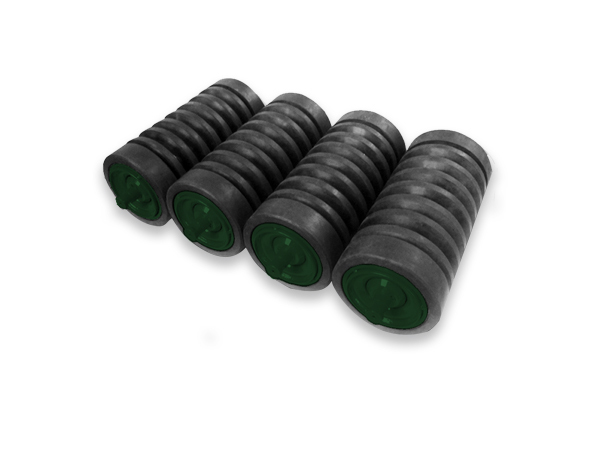 ConveyorPro Rubber Impact Rollers are manufactured using steel shell and rubber discs. 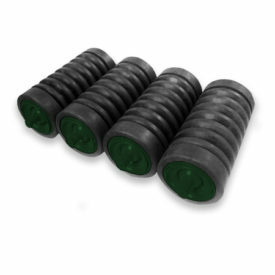 Impact rollers are manufactured as a steel shell with surrounding rubber discs. Impact idler frames and rollers are used at conveyor loading and transfer points for added protection from lump material dropped from height during the transfer process. To send us your exact roller specifications, hover over the Technical Specs button below to reveal our idler frames Enquiry Form, which can be filled out and emailed directly to us. As a trusted name in the Australian mining sector for over 30 years, Transmin engineering stands behind the quality and reliability of the ConveyorPro Range. The range has been designed and compiled with quality, flexibility, fast availability and cost-effectiveness in mind. Our dedicated Parts, Servicing and Engineering departments are on-hand with technical support around the clock, including on site assistance. Contact Transmin for more information.